1. Macro trends in adventure recreation are making their way to the pool. The sport of climbing has seen a major increase in participation, particularly in the indoor climbing market. Sport climbing will be an official event at the 2020 Summer Olympics and 2018 climbing documentaries The Dawn Wall and Free Solo received a host of awards and nominations from the film festival circuit, including an Academy Award nomination for Free Solo. Climbing walls are popping up in playgrounds and fitness centers, so why not add an AquaClimb climbing wall to your pool. Along the same lines, active adventure is on trend with an explosion of zipline and ropes courses across the country. Adults and children are both drawn to thrilling, active experiences in place of passive entertainment. 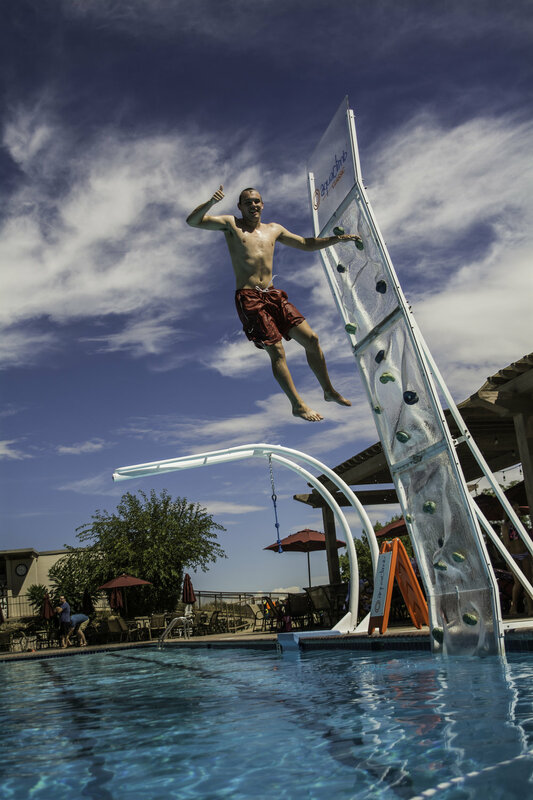 AquaClimb products like the AquaNinja and the AquaZip’N allow your facility to capitalize on this trend, offering unique and fresh attractions. According to Athletic Business, the co-location of competitive and recreational pools has been trending for the last 5-6 years because it maximizes the use of available land. Thinking outside the box on recreation pool design, there are many options to consider in terms of a community pool. When planning your space, think about poolside adventure elements that appeal to a wide audience and draw new or repeat visitors. Features like an AquaClimb climbing wall or an AquaNinja can serve a dual purpose of recreation and training, supporting the competitive programming as well as services as fun attractions. As more pools from the 60s, 70s and 80s near the end of their useful life, communities are thinking about future pool design. Even existing pools are looking to upgrade their amenities, with 24% of pool facilities planning to add climbing walls in the next three years, according to the Recreation Management 2019 Aquatic Trends report. A climbing wall is the #2 desired feature, significantly ahead of slides, inflatables or playgrounds. Diving boards did not even make the top 10, as more facilities like the Highlands Ranch Community Association are replacing outdated dive boards with more unique elements such as AquaClimb climbing walls. Want to learn more about these emerging trends? Check out our upcoming webinar on April 11.